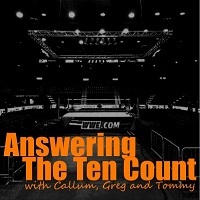 A wrestling podcast spanning no fewer than three continents. Join Callum, Aussie Greg and Tommy Gunn covering the week in WWE, TNA, Progress Wrestling, ROH and Indie Wrestling. Answering The Ten Count – The 100th Episode Spectacular! Answering The Ten Count Episode 91 – Where The Hell is Tommy? Thank goodness that Total Divas is back – means that the guys don’t have to talk about Raw or TNA…. Answering The Ten Count Episode 87 – What’s a Wicket? Answering The Ten Count Episode 75 – What’s In Your Briefcase?